Time for making new memories, experiencing new activities, and embracing life! NOTE: If you prefer a ‘Looser Fit’, then order one size up, than you normally would wear. I absolutely love these shorts. My first pair I got in Black, and a week later I ordered another in Navy Blue. I really like that they are high waisted. I’m 57 and I don’t think I need to be showing the world by behind. These cover you, and with the high waist, it keeps your jiggle, from jiggling. They also wash well. I’ve noticed no color running, nor was there any odor to them. And they dry just as well. I’ve dried both of mine in the dryer and hung them up to air dry too. I’ve had no snags, thus far. I am so happy that I found these shorts online. I was having a difficult time finding work out clothes that wasn’t for the 20 something-year-old bodies. I didn’t want it all hanging out when I was working out on the stairs climber! And my cell phone fits in the side pocket perfectly!! 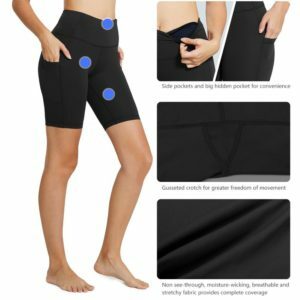 I can’t believe no one thought of these pockets sooner. I have never had a place to put my phone while exercising and listening to music. I like these pockets more than I had anticipated I would. I was happy that I found a high waisted workout short. I have a little wallet that I usually carry in my jeans’ back pocket, but I have put it in my shorts pocket as well. Since they have 87% polyester, they do tend to be a little warm. But I’m usually warm, no matter what I have on. I’m not a big polyester person. In fact, I usually avoid buying anything with polyester in it. I didn’t pay attention to the material till after I had gotten my first pair. It wasn’t that big of an issue, because I ordered a second pair. Of course the pocket, Except for a smartphone like the Samsung Note, any other smartphone will fit in the pocket. And it is secure when it’s in the pocket. Has never fallen out or been pulled out. Like I said, I really like those pockets! The color choice (7 in fact)–I will be buying more of these in other colors. I like that they are not sheer. Sometimes that kind of material can be kind of see-through. These are not! Color doesn’t run. Nor did they have any kind of odor when I took them out of the package. The fact that their made out of polyester and tend to make me warm. But as I stated above, I am usually always warm, and it didn’t stop me from buying a second pair. The cost.being $18.99 is a lot for a pair of shorts–in my opinion. I don’t know maybe the pockets make it worth it, but I’d buy all the colors if they ever went on sale. I am a huge fan of these shorts. I have been telling all my gall friends about them. When I’m down south, their usually my go-to shorts!! Would I recommend these shorts? Absolutely!! My rating in 8 out of 10. Took 2 points off for my cons. Could Medical Marijuana be for You? Are You Ready for Thanksgiving? Supplement Your Income or Start Your Own Business Today! Are You Ready for Winter?? Reminder to Get Your Flu Shot! RENT A RV & GO CAMPING! Learn to Earn for FREE, Today! SINGLE & CAN’T FIND ANYONE?